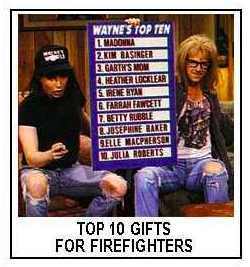 Here are the 10 most purchased gifts for firefighters from FireAwards.Com. The list is based on our sales figures and customer inquiries for the year 2016. These "Best Selling" fire themed gift items are just a sampling of our Fireman's Pride Line of firefighter gifts and awards. Prices range from a high of $314.95 for the Bronze Firefighter Helmet Award to a low of $9.95 for the Firefighter Bottle Opener Dog Tag , so there is something available to suit everyones budget. FireAwards.com is your source for custom firefighter awards and great firefighter gifts as well as awards and gifts for police and EMS personnel. The items are in order of popularity - just click on an item to see the description and price.